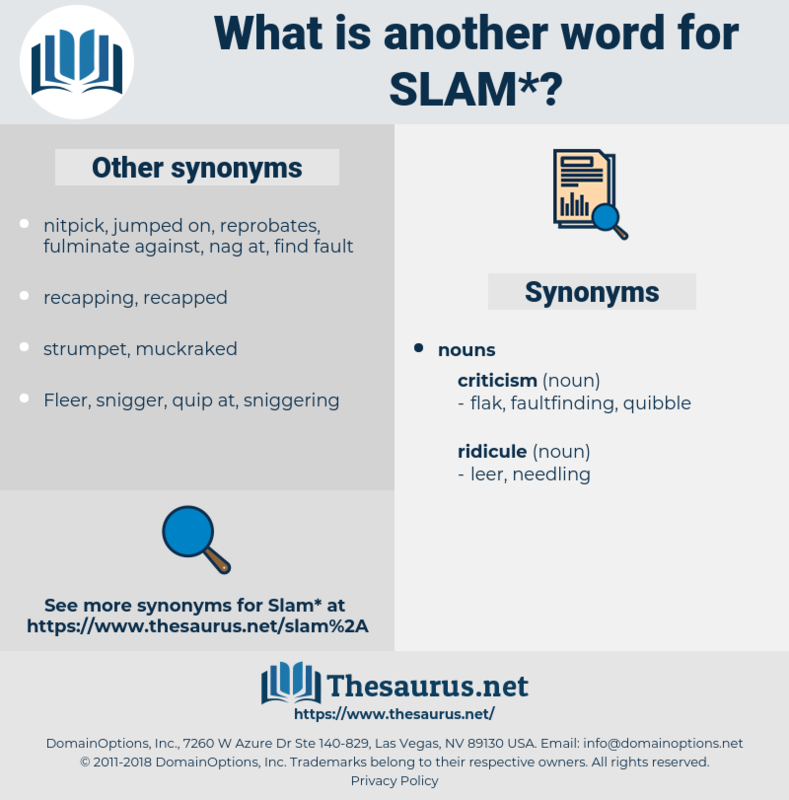 What is another word for slam? strike violently; " slam the ball"
failure, loss, flattery, compliment, praise. flatter, tap, help, aid, fail, assist, lose, open. Kitty retreated - they heard the door of room slam - and Louisa went on with her plate scraping. As Rose - Ellen let the front door slam behind her, she saw Daddy coming slowly up the street. salaam, saxicoline, slain, sea lane, salome, scalene, slow lane, slummy, slum, sea lion, salian, schoolman, sullen, slimy, salina, solemn, selenium, slime, solomon, social lion, Shiah Islam, salmo, scullion, sexual union, sauce-alone, selene, sloanea, slam on, swollen, salem, sea holm, solan, saline, squall line, silene, salomon, solon, selma, scallion, solo man, schliemann, salami, scolion, sicilian, skyline, shallon, Salim, sash line, seal in, salmon, slim, Sally Lunn, Schoolma'am, sealyham, salmi, salon, sockeye salmon, solanum, slalom, saloon. 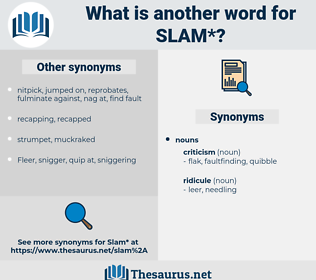 little slam, small slam, grand slam.